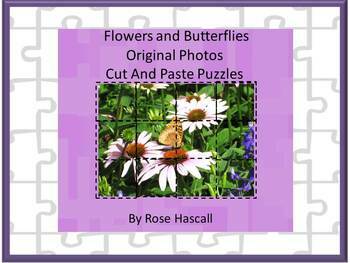 In this printable packet, you will find puzzles of original photos of flowers and butterflies from my own flower gardens here in Iowa. Puzzles will help students in preschool, kindergarten, special Ed, and autistic classrooms develop problem solving skills, fine motor skills, and hand eye coordination. Students cut out puzzle pieces and then paste onto the corresponding page. Or, if you prefer, laminate them and use them as a regular puzzle that can be worked again and again. These no prep puzzles are ready to print and use immediately. These cut and paste puzzles are appropriate for use in a daycare, preschool, kindergarten and 1st grade classrooms. They may also be used as independent tasks for children with Autism or other Special Education needs. Please browse some of the other categories in my store. Please check out my Holiday Products.